The Donington Park Classic Motorcycle Festival has become one of the largest Classic bike events in Europe, and returns on 7-9 August, with a bumper entry of over 500 bikes expected to take part, lots of parades and numerous off track activities also included in the exciting schedule. Several star names of the world of motorcycling have already confirmed appearances at this year’s festival, including the legendary Freddie Spencer, Niall Mackenzie, Steve Parrish, Ron Haslam and Jim Redman. Most of these are expected to ride in the star parades, whilst Parrish will host a special version of his acclaimed live tour in the Senna Fangio Suite on the Saturday evening, with many of the star stars set to appear here also. The three days of action are ram-packed with top quality racing action from bikes dating as far back as the 1950s. Racing highlights include the UK round of the 2015 FIM Europe Vintage Championships, round four of the ACU Classic 500cc Championship, Round four of the ACU Post Classic 350cc Championship, and the Wheatcroft Trophy for pre-1986 machines. Further action comes from the Lansdowne Cup Series races for Grand Prix machines from the 1950s and 60s and the UK round of the Camathias Cup for pre-1972 sidecars. As well as the star parades, there is more on track activity in the form of displays from Grand Prix machines from 1949, superbikes and sidecar taxi rides on the Saturday evening. The Vintage Japanese Motorcycle Club (VJMC) will return once more to organise the motorcycle show in the Exhibition Centre with numerous club stands providing hundreds of machines to savour. 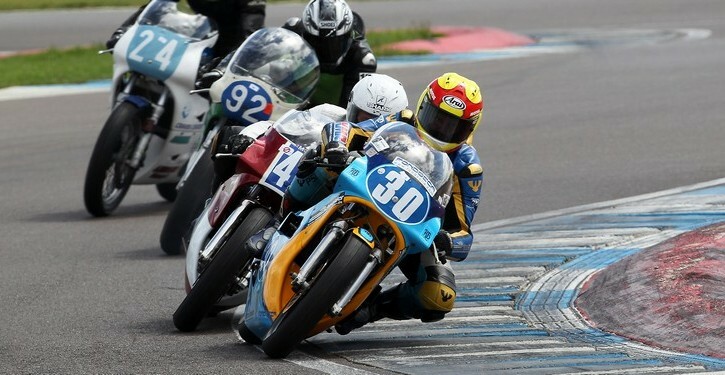 A massive ride-out of VJMC machines round the circuit will take place over the weekend. Off track displays will also feature a stunning collection of bikes from the Sammy Miller Museum.